The different types of renewable energy are power that comes from renewable resources such as the sun, wind and organic matter. These resources are constantly replenished by nature and are a cleaner source of energy. Adding more types of renewable energy in our world means cleaner air and a more stable energy supply for the future. Plus, it’s homegrown! The shortage of power, the rapid consumption of non-renewable energy, the ever-increasing demand for power supply, the daily warnings about our environment are enough signs to tell us that it’s time we do something. Living Off The Grid? If I have startled you with that proposition, let me tell you that living off the grid not only helps the environment and helps save power; it also cuts down our electricity bill substantially. Now, that’s a tangible benefit apart from all the good you'll do for the world and you'll feel good too. Let us first study the advantages of living off the grid using different types of renewable energy. Who wants to depend on public utilities all the time? Living off the grid helps you rely only on your resources and not the ones supplied by governments or corporations. How often have you cursed when faced with a power outage in the midst of some important work or a party? Wouldn’t you like to take charge of such factors affecting you life? With alternate power solutions, you can. How would you feel when you don’t have to pay for the power you use? Wouldn’t it be delightful to use as much power as you want without worrying about the electricity meter? You can make use of the abundant power available in the nature to light up your home and make your food. The different types of renewable energy like solar power solutions and the wind power solutions are the answers to your power quest. How would you feel if the electricity bills stop coming in your letter box? The types of renewable energy solutions give you a return on investment very soon, thus making the power supply to your home eventually free! Don’t you bless the people who planted trees years ago not expecting them to miraculously grow? They planted those trees for the future generations. Help make the future generations secure by giving them a greener, healthier world. Cut down on the usage of non-renewable sources of energy. Live Off The Grid, look for different types of renewable energy and you will be surprised to learn that they are not only cost-effective but also extremely feasible. 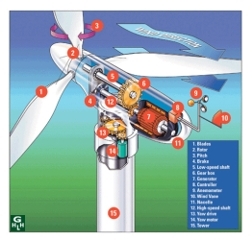 Small scale wind power is the name given to units that supply 50kw or less of power. Individuals may purchase these units or make their own to reduce or eliminate their dependence on grid electricity for economic or environmental reasons. Wind turbines have been used for household electricity generation in conjunction with battery storage for decades. It is also usually used in a grid-tie system, in conjunction with a local utility grid. Over this period of time, more and more people are purchasing or building their own wind turbine generators. This has reduced carbon emissions and helped save our non-renewable resources. Solar power is clean, free, and available every day. The costs of solar power systems has come down over 80% over the past two decades. There are two main forms of solar power for residential use, the "grid tie" system and the "off grid" or stand alone system. In a grid tie system a home has solar cells but is still linked to the local electrical grid. The solar panel collects electricity in DC (direct current) then an inverter converts it to AC (alternating current or house current) for home use. Electricity that is not used in the home is then fed back into the power grid, In fact you meter actually runs backwards. You are building credit on your electric bill. This is called "net-metering". The benefit or upside of the grid tie system is that it does not require expensive batteries for the storage of power. The grid acts as the storage system, and your home and the grid exchange power as needed. The downside of the grid tie system is you have no backup when your grid goes down (a power failure). Off grid or stand alone systems are usually used in remote locations where there is no power grid to connect to. They are more expensive, but do allow for electrical independence. These systems require Deep-Cycle batteries for storing electricity as well as a charge controller to assure the flow of electricity form the cells does not overcharge the batteries. Do you want to save money on gasoline or Diesel? The visit our alternative fuel page to see how you can do this yourself. We are showing you two e-books about building systems of alternative fuel. Click on the links below to learn more about renewable energy.